The Greyhound breed is a seemingly ironic one: they are fast, exceptional runners, but can make low maintenance companions when living indoors with their families. Boding kind and pleasant manners, they can be raised with other canines easily. While they are great animals to raise in a family home environment, do keep in mind that they are natural chasing dogs, meaning if you permit them the open space to roam in a field chances are they will begin to chase another animal smaller than they are. The hounds are people pleasers, but can be good at detecting strangers in their home with reservation. Greyhounds are notorious for running at very high speeds, in fact they are one of the fastest breeds of canines making them an ideal match for an owner that enjoys running. They are also loaded with lean muscle tissue and very strong for their size. Like most dogs, the greyhounds will enjoy a long walk on leash and even a quick run or jog. They are fast creatures by nature, but may not fulfill a long distance run for miles. They are not a breed that is adaptable to reside in a mostly outdoor environment as they tend to like living indoors more. They are quick running animals that when left unattended in an open space will begin to chase or hunt anything that moves, and many animals in these spaces are much smaller than they Greyhounds, making the chase very elementary for them. Their fur coats do not require a lot of maintenance, as they will only need an occasional brushing for good hygiene. If raised as a house pet, the Greyhound can live a long and injury free lifestyle. When they are utilized for running or racing hounds, they can develop injuries over time from running or racing extensively for years. With no major health issues to be wary of, they can develop some minor ones such as gastric torsion, osteosarcoma and esophageal achalasia. Muscle injuries from racing can be present if the vet detects this they may suggest some minor screening. Tail-tip injuries have been noted as well as a reaction to barbiturate anesthesia. Generally, the Greyhound has a lifespan of ten to thirteen years and typically weighing in around sixty pounds as a full grown canine. 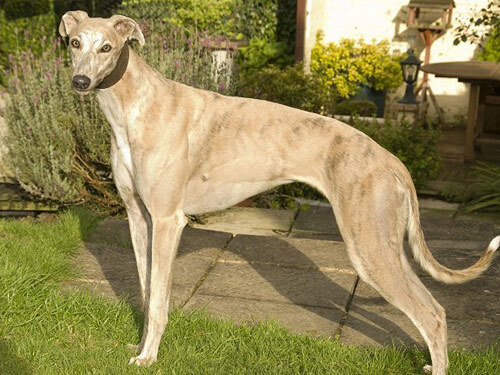 Dating all the way back to 1014, the Greyhounds were found in Great Britain. They were one of the first breeds of a sight hound and were noted as common dogs in Egypt, Greece and Roman Times even before that time with no exact date of the first one of its kind known. As they continued to be bred, by the 18th century observing the Greyhounds running for sport became a very popular attraction for the socially elite circles. With the success of racing on a track in the early 1900’s, the Greyhounds became a crowd favorite for entertainment and still is to this day. Receiving their nod from the AKC in 1885, they went on to become show dogs as well. Currently, there is even a National Greyhound Association to get them properly registered.